Patrick Campbell focuses his litigation practice on white collar and corporate criminal and regulatory matters, as well as commercial litigation. 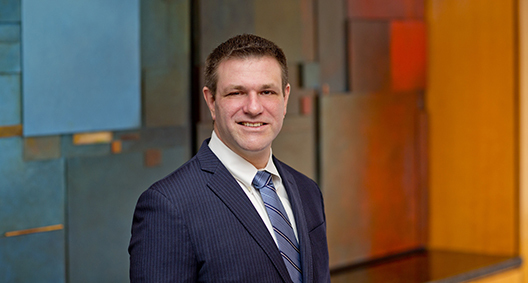 With a breadth of experience, Patrick has developed a legal skill set that makes him a strong addition to any team faced with complicated litigation. His calm demeanor enables Patrick to remain focused on the matters facing his clients, regardless of the level of complexity present. Patrick is also involved in the development of junior associates at BakerHostetler. Over the past several years, he has formally and informally mentored many of the New York office's junior associates, and he is an active member of the New York office's Mentorship Committee. Patrick also devotes his time to the Federal Bar Council and its First Decade Committee, having co-chaired the council's 2015 annual Fall Bench and Bar Retreat. Acts as a key member of a team that represents numerous foreign claimants in the then-largest civil forfeiture action brought by the United States Department of Justice's Kleptocracy Asset Recovery Initiative involving alleged corruption and embezzlement by the former Nigerian president and his family and associates. Acted as a key member of a team that represents a former London-based JPMorgan managing director whose cooperation was sought in an investigation related to a multibillion-dollar trading loss for the bank. Was responsible for, among other things, the review of thousands of client documents to prepare effective defense, and helped develop a strategy to navigate the client through parallel U.S. and U.K. investigations. The team secured a rare nonprosecution agreement with the Justice Department and agreements with the Securities and Exchange Commission and the Commodity Futures Trading Commission (CFTC), including one of the first nonprosecution agreements executed by the CFTC for an individual. Since 2009, has worked on a variety of litigation matters in connection with BakerHostetler's role as court-appointed counsel to the Securities Investor Protection Act (SIPA) trustee, Irving H. Picard, for the liquidation of Bernard L. Madoff Investment Securities LLC. Is a key member of the Picard v. Madoff et al. legal team, which is responsible for the SIPA trustee's avoidance litigation seeking to recover assets for the Fund of Customer Property for ultimate distribution to the defrauded customers of Madoff's Ponzi scheme. Assisted the former ethical practices attorney for Local 14-14B of the International Union of Operating Engineers by managing a team that oversaw the enforcement of the Consent Decree, including anticorruption investigations, commencement of disciplinary proceedings against corrupt union members and oversight of the union's policies and procedures, to ensure fair job referrals and elections. Counsels major construction and energy companies on “best practices” for corporate governance and ethics and compliance matters. Represented an individual in connection with a high-profile public corruption investigation conducted by the Department of Justice. Conducted Foreign Corrupt Practices Act due diligence for an international provider of food, beverage and retail services for airports and motorways in connection with the potential acquisition of food and beverage outlet service contracts for airports in India. Represented employees of an orthopedics company in a Department of Justice investigation into the alleged provision of illegal kickbacks to orthopedic surgeons. Represented a worldwide pharmaceutical distribution company in connection with a nationwide Drug Enforcement Administration investigation into the distribution of controlled substances under the Controlled Substances Act. Represented a real estate management company in litigation brought by a disgruntled commercial tenant who sued the client and attempted to place blame on the client for his business failure, alleging the client had failed to maintain the property. Navigated rules and procedures related to state court litigation, handled document discovery and depositions, and ultimately settled the matter on the eve of trial on terms favorable to the client. Former Featured Writer and Editor, "Guantanamo and Beyond: A Blog on Executive Detention, National Security and Due Process"
Represented Alabama death row inmates in capital post-conviction litigation, including current representation of an Alabama death row inmate in his federal habeas corpus proceeding.